Sharing Reading Partners’ messages with your personal and professional connections through social media, email, and in-person conversations can have incredible reach, making a true impact in spreading awareness of our mission. Word-of-mouth is the top brand driver for Reading Partners. In celebration of our 20th anniversary, please consider sharing your personal story about how working with students has affected you. 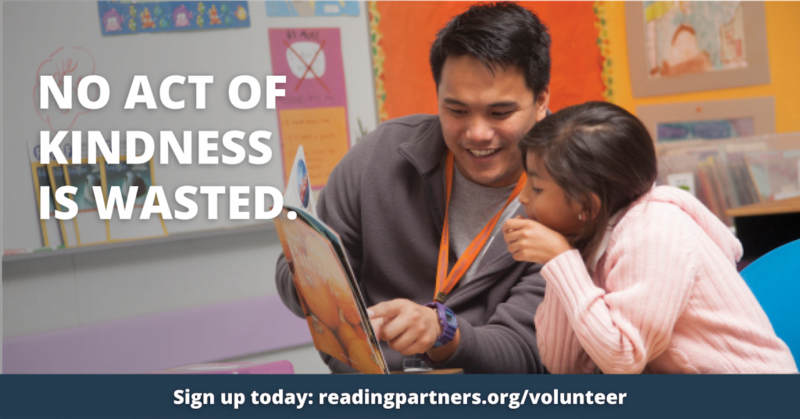 It will help others understand the important work that Reading Partners is doing and how they can be a part of this life-changing organization. Share reasons why you are a Reading Partner using #WhyIAmAReadingPartner. Download the full refer a friend volunteer toolkit. Post a selfie with a caption or use the #WhyIAmAReadingPartner sign to share why you are a Reading Partner. Be sure to tag @ReadingPartners and use the hashtag #WhyIAmAReadingPartner ​when posting on Facebook, Instagram, Twitter, and Snapchat. Share far and wide and get your friends to join you! Did you know that nearly 9 million low-income K-5 students in the US are not reading at grade level? 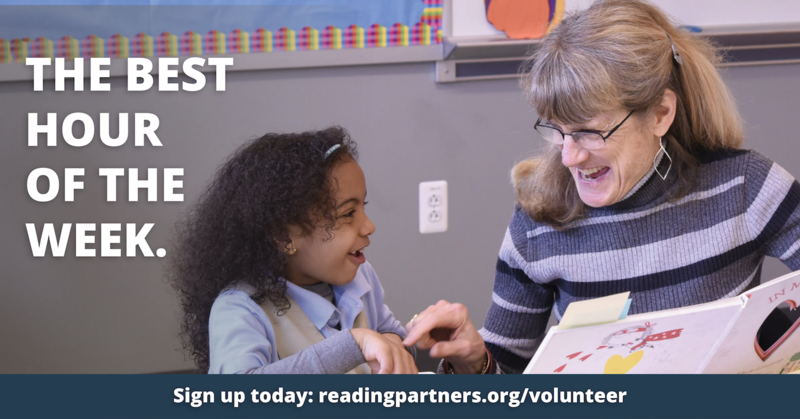 @ReadingPartners and volunteers have been tackling the problem for 20 years. That’s #WhyIAmAReadingPartner. Will you join me? Have I told you about my volunteer work with Reading Partners? It’s an incredible organization that connects volunteers with students to help kids read at grade level. By fourth grade, students need to be able to read to learn; those who fall behind are four times more likely to leave high school without a diploma. This academic year marks Reading Partners’ 20th anniversary, and I want to help spread the word about the work they’re doing. I currently volunteer to tutor the same student for one hour each week. The progress is visible, and we love to celebrate every milestone along the way. 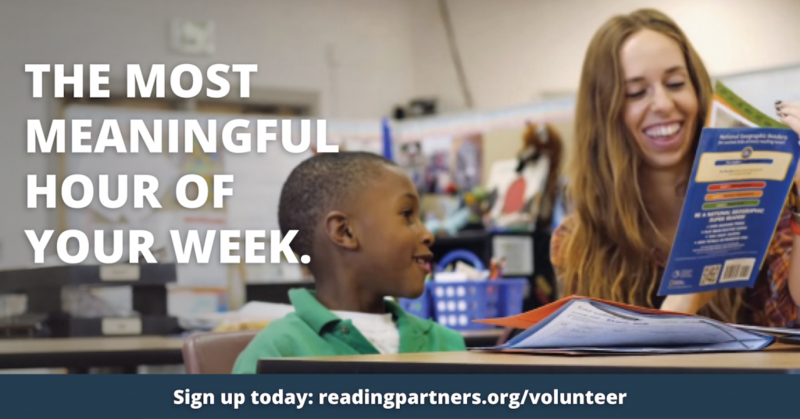 If you’re looking for an impactful way to make a difference, I recommend volunteering with Reading Partners. It has become one of the most rewarding hours of my week. If you can’t donate your time but are able to make a ​monetary donation​, that also goes a long way. A $50 donation funds training for a group of new volunteers, and $100 affords 20 students a book of their own to take home. If you’re interested in learning more, I’d love to answer any questions about my experience. Or you can head over to ​https://readingpartners.org/volunteer​ for more information. Thanks for your support, and I hope you’ll join me! Did you know 4 out of every 5 of our nation’s low-income fourth graders are not reading at grade level? This means many students are falling behind at the critical transition point in their educations. The good news is, volunteers across the country are joining together to take action and support students’ literacy education. Right click the images to save.